Those who fulfil this achievement join an elite band who have experienced everything from the remoteness of the Scottish Highlands to the hedgerows of the Cornish countryside; urban conurbations fizzing with activity to rural villages quaint in tradition. 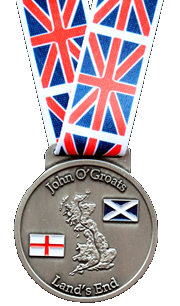 JustDoneItMedals has produced an embossed medal on a Union flag lanyard, with high quality enamelled flags, to be a celebration and souvenir of your achievement. www.cycle-endtoend.org.uk is an introducer for JustDoneItMedals and accepts no responsibility for transactions or products.